Scrapbook*: • "Mr. and Mrs. E. R. Naudain of No. 903 Lomita avenue [Glendale, California] entertained the Glendale Thimble Club and their husbands on Saturday evening [5 Dec 1914]. The decorations were chrysanthemums. Five Hundred was played throughout the evening and the scores were kept on pretty hand-painted cards, the highest score of the ladies going to Mrs. Chester Kling, and of the gentlemen to Mr. J. W. Usilton. Those present were Mr. and Mrs. J. W. Usilton, Mr. and Mrs. Chester Kling, Mr. and Mrs. J. C. Waite, Mr. and Mrs. John Roman, Mr. and Mrs. Leon Wilkinson of Los Angeles, Mr. and Mrs. Herman Nelson and Mr. and Mrs. W. E. Heald." Obituary*: "Earl R. Naudain Dies in Calif.
"Earl Robert Naudain, 80, a native of Algona, succumbed at Glendale, Cal. where he had been living for many years, June 13. Funeral services were held June 19, with services conducted by Glendale Lodge of the Elks order. Burial was in Grand View Mausoleum, beside his wife. "Surviving are two brothers Vallo of Algona, and Glen of Chapel Hill, N. C.
Note*: • He was in the electrical business in Glendale, California. [S1] Ruth Bennett, Naudain Family of Delaware (Geneva, Neb. : n.pub., 1941), p. 97 (naming William Eliason Naudain as his father). This material is a typescript of "notes" in Ms. Bennett's possession and apparently was originally written and compiled by James W. Lattomus. Copies are with the D.A.R. Library, Washington, D.C., and Roger Bartlett, Austin, Tex., and can be viewed at http://www.rabgenealogy.com/ui53.htm. The notes contain some inconsistencies, and page 45 was missing from the D.A.R. Library copy when it was copied. [S1338] The Algona Upper Des Moines, Algona, Iowa, online at http://www.newspapers.com, 21 Dec 1939, p. 1, col. 1 (obituary of William Eliason Naudain) (naming William Eliason Naudain as his father). [S1] Ruth Bennett, Naudain Family of Delaware, above, p. 97 (naming Ella A. Foster as his mother). [S1338] The Algona Upper Des Moines, Algona, Iowa, above, 21 Dec 1939, p. 1, col. 1 (obituary of William Eliason Naudain) (naming Ella A. Foster as his mother). [S961] Find A Grave, online at http://www.findagrave.com, memorial for Earl Robert Naudain, memorial no. 47542651, viewed on 30 Jan 2014. [S961] Find A Grave, online, above, memorial for Earl Robert Naudain, memorial no. 47542651, viewed on 30 Jan 2014 (not giving the date). [S961] Find A Grave, online, above, memorial for Orma E. Vesper Naudain, memorial no. 47542652, viewed on 30 Jan 2014 (not giving the date). [S1418] Los Angeles Times, Los Angeles, Calif., online at http://www.newspapers.com, 30 Apr 1939, p. 38, col. 3 (obituary of Mrs. Orma E. Naudain) (naming Earl Naudain as her husband without giving a marriage date). [S961] Find A Grave, online, above, memorial for Earl Robert Naudain, memorial no. 47542651, viewed on 30 Jan 2014 (not naming the city). [S1338] The Algona Upper Des Moines, Algona, Iowa, above, 4 Jul 1963, p. 8, col. 1. [S1418] Los Angeles Times, Los Angeles, Calif., above, 6 Dec 1914, p. 40, col. 5 (under "Society") (first bullet). [S1445] Kossuth County Advance, Algona, Iowa, online at http://www.newspapers.com, 18 Jul 1946, p. 5, col. 4 (under "City Briefs") (second bullet). [S1338] The Algona Upper Des Moines, Algona, Iowa, above, 4 Jul 1963, p. 8, col. 1 (with obvious typographical errors corrected). [S1] Ruth Bennett, Naudain Family of Delaware, above, p. 97 (first bullet). [S1338] The Algona Upper Des Moines, Algona, Iowa, above, 19 Apr 1938, p. 5, cols. 5-6 (second bullet). [S1445] Kossuth County Advance, Algona, Iowa, above, 11 Sep 1945, p. 2, col. 1 (naming Earl R. Naudain as her father and attributing that information to an unidentified newspaper in Glendale, California). Other Names*: Orma Vesper Naudain, Orma Naudain, Anna Vesper Naudain, Anna Naudain. Obituary*: "NAUDAIN. At Research Hospital, April 28. Mrs. Orma E. Naudain, beloved wife of Earl Naudain, loving mother of Lois Whaley and daughter of Frank H. Vesper and the late Eva Vesper, all of Glendale, Cal. "Funeral at Congregational Church, Wilson and Central avenue, Glendale, Cal., Monday, May 1, at 2 p.m. Entombment Grand View Mausoleum, C. R. Vesper, Inc. directors." "Word was received here this week by relatives that Mrs. Orma Naudain, the wife of Earl Naudain, and a daughter-in-law of the W. E. Naudains of Algona, had passed away at Glendale, California. "Mrs. Naudain was raised in Algona, her maiden name being Orma Vesper, and her father, Frank Vesper was at one time a banker in Algona, survives. She was about 54 years of age, and had been ill about a month. "Mrs. Naudain was widely known in club and fraternal circles on the west coast. She was a founder of the Omar Shrine and a past worthy matron of the Eastern Star. Born in Lawn Hill, Iowa, she spent most of her youth in Algona, and attended Drake University before her marriage to Earl Naudain. • Her Find A Grave memorial, which includes a picture of her mausoleum marker, is here. [S961] Find A Grave, online at http://www.findagrave.com, memorial for Orma E. Vesper Naudain, memorial no. 47542652, viewed on 30 Jan 2014 (naming Frank Horn Vesper as her father). [S961] Find A Grave, online, above, memorial for Frank Horn Vesper, memorial no. 47551800, viewed on 30 Jan 2014 (naming Frank Horn Vesper as her father). [S961] Find A Grave, online, above, memorial for Orma E. Vesper Naudain, memorial no. 47542652, viewed on 30 Jan 2014 (naming Eva Glenora Quick as her mother). [S961] Find A Grave, online, above, memorial for Eva Glenora Quick Vesper, memorial no. 47551799, viewed on 30 Jan 2014 (naming Eva Glenora Quick as her mother). [S1418] Los Angeles Times, Los Angeles, Calif., online at http://www.newspapers.com, 1 Jan 1939, p. 12, col. 3 (obituary of Mrs. Eva Vesper) (naming Mrs. Eva Vesper as her mother). [S961] Find A Grave, online, above, memorial for Orma E. Vesper Naudain, memorial no. 47542652, viewed on 30 Jan 2014. [S1] Ruth Bennett, Naudain Family of Delaware (Geneva, Neb. : n.pub., 1941), p. 97. This material is a typescript of "notes" in Ms. Bennett's possession and apparently was originally written and compiled by James W. Lattomus. Copies are with the D.A.R. Library, Washington, D.C., and Roger Bartlett, Austin, Tex., and can be viewed at http://www.rabgenealogy.com/ui53.htm. The notes contain some inconsistencies, and page 45 was missing from the D.A.R. Library copy when it was copied. [S1418] Los Angeles Times, Los Angeles, Calif., above, 30 Apr 1939, p. 38, col. 3 (obituary of Mrs. Orma E. Naudain) (naming Earl Naudain as her husband without giving a marriage date). [S1418] Los Angeles Times, Los Angeles, Calif., above, 30 Apr 1939, p. 38, col. 3 (obituary of Mrs. Orma E. Naudain). [S1418] Los Angeles Times, Los Angeles, Calif., above, 30 Apr 1939, p. 38, col. 3 (obituary of Mrs. Orma E. Naudain) (naming the cemetery but not giving the crypt number). [S961] Find A Grave, online, above, memorial for Orma E. Vesper Naudain, memorial no. 47542652, viewed on 30 Jan 2014, citing Los Angeles Times (first bullet). [S1338] The Algona Upper Des Moines, Algona, Iowa, online at http://www.newspapers.com, 11 May 1939, p. 1, col. 6 (second bullet). [S1145] Riverview Cemetery, Algona, Iowa, online http://iagenweb.org/kossuth/cemetery/Riverview-Algona.htm, viewed 18 Aug 2007. [S1145] Riverview Cemetery, Algona, Iowa, online, above, viewed 18 Aug 2007 (naming the place but not giving the date). [S1354] Ottumwa Tri-Weekly Courier, Ottumwa, Iowa, online at http://www.newspapers.com, 30 Jan 1915, p. 7, col. 1 (giving the date but not the place). [S1354] Ottumwa Tri-Weekly Courier, Ottumwa, Iowa, above, 30 Jan 1915, p. 7, col. 1. Other Names*: Vallo Naudain, V. V. Naudain. [S1] Ruth Bennett, Naudain Family of Delaware, above, p. 97 (giving Kingar as her surname) (giving the date but no other information). [S1338] The Algona Upper Des Moines, Algona, Iowa, above, 17 Jul 1969, p. 2, cols. 1-2 ("Naudains Wed 50 Years"). [S312] Social Security Death Index, online at http://tinyurl.com/AncestrySSDI, viewed on 27 Mar 1998 (stating that he died in Nov 1979; not naming the place of death but stating that he lived in Algona, Iowa when he died). [S1145] Riverview Cemetery, Algona, Iowa, online, above, viewed 18 Aug 2007 (giving the date but not the place). 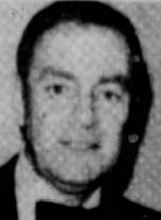 [S1482] The Des Moines Register, Des Moines, Iowa, online at http://www.newspapers.com, 6 Nov 1979, p. 6B (p. 14), col. 3 (obituary for Vallo Naudain). [S1145] Riverview Cemetery, Algona, Iowa, online, above, viewed 18 Aug 2007 (giving the place but not the date). [S1482] The Des Moines Register, Des Moines, Iowa, above, 6 Nov 1979, p. 6B (p. 14), col. 3 (obituary for Vallo Naudain) (giving the date but not the place). [S1445] Kossuth County Advance, Algona, Iowa, online at http://www.newspapers.com, 10 Jun 1941, p. 7, col. 2 (under "City Briefs") (first bullet). [S1445] Kossuth County Advance, Algona, Iowa, above, 26 Mar 1957, p. 23, col. 6 (under "Locals") (second bullet). [S1445] Kossuth County Advance, Algona, Iowa, above, 19 Oct 1937, p. 2, col. 4 (under "Twenty Years Ago") (stating that he had enlisted in the Navy in California in 1917). Other Names*: Zada Kinyon Naudain, Zada Kingar Naudain, Zada Naudain. Note*: • A family history gives Kingar as her surname, but that apparently was an error. [S1] Ruth Bennett, Naudain Family of Delaware (Geneva, Neb. : n.pub., 1941), p. 97 (giving Kingar as her surname) (giving the date but no other information). This material is a typescript of "notes" in Ms. Bennett's possession and apparently was originally written and compiled by James W. Lattomus. Copies are with the D.A.R. Library, Washington, D.C., and Roger Bartlett, Austin, Tex., and can be viewed at http://www.rabgenealogy.com/ui53.htm. The notes contain some inconsistencies, and page 45 was missing from the D.A.R. Library copy when it was copied. [S1338] The Algona Upper Des Moines, Algona, Iowa, online at http://www.newspapers.com, 17 Jul 1969, p. 2, cols. 1-2 ("Naudains Wed 50 Years"). [S312] Social Security Death Index, online at http://tinyurl.com/AncestrySSDI, viewed on 13 Sep 2002 (stating that she died in Nov 1979; not naming the place of death but stating that she lived in Algona, Iowa when she died). [S1475] Algona Kossuth County Advance, Algona, Iowa, online at http://www.newspapers.com, 5 Oct 1964, p. 1, col. 5. [S1] Ruth Bennett, Naudain Family of Delaware, above, p. 97 (giving Kingar as her surname) (first bullet). [S1445] Kossuth County Advance, Algona, Iowa, online at http://www.newspapers.com, 28 Apr 1953, p. 8, col. 1 (second bullet). Dr. Glenn Naudain, circa 1942. "Glenn Naudain, who was born and raised in Algona, and who has been on the faculty of the University of North Carolina for some years, was guest speaker, Monday noon, at the Rotary meeting. "During the war he served as a lieutenant colonel in the army, doing research work in biological warfare and chemical warfare, and part of his talk was devoted to some interesting aspects of that work. "He predicted that within ten years round trip flights to Europe will cost about $150 and round trips to Asia only $100 more, and that many of us would be taking our vacations accordingly. "Plastics will be one of the chief building materials of the future, he also predicted, and it will be possible to call up and order an additional room to be attached to a plastic house." "ROCK HILL [S.C.], June 19 .—C. A. Haskew of the Winthrop College faculty will become head of the college’s department of chemistry and physics beginning Sept. 1. "Acting head of the department for the last two and one-half years, Mr. Haskew was elected by the board of trustees, at its meeting here June 14, to fill the head position. "Dr. G. G. Naudain, former head of the department on leave of absence since November 1946, was unable to resume his teaching duties at Winthrop because of physical disabilities. "Word has been received here of the death on Monday of Dr. Glenn G. Naudain, 78, at his home in Rock Hill, So. Carolina. Dr. Naudain is a brother of Vallo V. Naudain of Algona. "Funeral services will be held at the Bass Funeral Home in Rock Hill at 2:30 p.m. Wednesday. The body will be flown to Algona where visitations may be made at the Gellenfeld-Schaaf-McCullough Funeral Home between the hours of 8 and 10 a.m. Thursday (today). "Graveside rites will be held at Riverview Cemetery at 10:30 Thursday morning with the Rev. Roger Brooks officiating. "Glenn G. Naudain was born Oct. 31, 1894, son of William Eliason and Ella Amanda Foster Naudain. He attended school in Algona where he was a popular student and played football during all four years of his high school career. "He attended Iowa State University at Ames from where he was graduated in 1917 with a Bachelor of Science degree and served with the U.S. Army as a Lt. Colonel during World War I. He was married to Lillian Gamrath in 1921 and a year later received his Masters degree, followed by his PHD in the science field in 1923. They lived at Pittsburg [sic], Pa. the next two years and in 1926 he went to Rock Hill, So. Carolina where he was a Professor of Chemistry and head of the Chemistry Department at the Teachers University. "Dr. Naudain received further schooling at Columbia University, Peabody College, Harvard University, the University of Maryland and the University of California, as well as studying in France and Germany. He served as a Colonel during World War II, then returned to Rock Hill where he was associated with the college again until his retirement in 1950. He then went into Private Consulting practice. "He was a Past Commander with the American Legion at Rock Hill and a 32nd Degree Mason. Note*: • He was in the Navy in World War I and taught chemistry at Iowa State College, his alma mater. "An honorary degree of doctor of science has been conferred on Dr. Glen G. Naudain, Algona man teaching at Winthrop college, Rock Hill, South Carolina, by the Academy of Arts and Sciences of Rio de Janeiro, Brazil, as a result of his furnishing the academy with copies of his research work. "Dr. Naudain is a son of Mr. and Mrs. W. E. Naudain of Algona, and a brother of Vallo Naudain. He teaches chemistry in the South Carolina College." [S1338] The Algona Upper Des Moines, Algona, Iowa, above, 18 Jan 1973, p. 8, col. 3 (obituary of Dr. Glenn G. Naudain) (naming William Eliason Naudain as his father). [S1338] The Algona Upper Des Moines, Algona, Iowa, above, 18 Jan 1973, p. 8, col. 3 (obituary of Dr. Glenn G. Naudain) (naming Ella Amanda Foster as his mother). [S961] Find A Grave, online at http://www.findagrave.com, memorial for Dr. Glenn G. Naudain, memorial no. 66278989, viewed on 1 Aug 2018. [S1145] Riverview Cemetery, Algona, Iowa, online, above, viewed 18 Aug 2007 (not giving the date). [S1338] The Algona Upper Des Moines, Algona, Iowa, above, 18 Jan 1973, p. 8, col. 3 (obituary of Dr. Glenn G. Naudain) (giving the year but no other information). [S961] Find A Grave, online, above, memorial for Dr. Glenn G. Naudain, memorial no. 66278989, viewed on 1 Aug 2018 (as shown on the photo of the tombstone). [S961] Find A Grave, online, above, memorial for Lillian Gamrath Naudain, memorial no. 66278990, viewed on 1 Aug 2018 (as shown on the photo of the tombstone). [S1338] The Algona Upper Des Moines, Algona, Iowa, above, 21 Oct 1976, p. 27, col. 1 (obituary for Lillian Belle Naudain). [S312] Social Security Death Index, online at http://tinyurl.com/AncestrySSDI, viewed on 27 Mar 1998 (stating that he died in Jan 1973; not naming the place of death but stating that he lived in Fort Mill, South Carolina when he died). [S1338] The Algona Upper Des Moines, Algona, Iowa, above, 18 Jan 1973, p. 8, col. 3 (obituary of Dr. Glenn G. Naudain). [S961] Find A Grave, online, above, memorial for Dr. Glenn G. Naudain, memorial no. 66278989, viewed on 1 Aug 2018 (giving the date but not the place). [S1338] The Algona Upper Des Moines, Algona, Iowa, above, 18 Jan 1973, p. 8, col. 3 (obituary of Dr. Glenn G. Naudain) (stating that gravesite rites would be held at 10:30 a.m. with Rev. Roger Brooks officiating). [S961] Find A Grave, online, above, memorial for Dr. Glenn G. Naudain, memorial no. 66278989, viewed on 1 Aug 2018 (not giving the date). [S1338] The Algona Upper Des Moines, Algona, Iowa, above, 27 Aug 1946, p. 1, col. 2 (first bullet). [S1397] The Times and Democrat, Orangeburg, S.C., online at http://www.newspapers.com, 20 Jun 1949, p. 10, col. 2 (second bullet). [S1338] The Algona Upper Des Moines, Algona, Iowa, above, 18 Jan 1973, p. 8, col. 3. [S1338] The Algona Upper Des Moines, Algona, Iowa, above, 18 Nov 1937, p. 1, col. 7 (second bullet). [S1411] The Greenville News, Greenville, S.C., online at http://www.newspapers.com, 17 Apr 1938, p. 24, col. 5 (third bullet). [S1] Ruth Bennett, Naudain Family of Delaware (Geneva, Neb. : n.pub., 1941), p. 97 (naming Homer Oscar Naudain as her father). This material is a typescript of "notes" in Ms. Bennett's possession and apparently was originally written and compiled by James W. Lattomus. Copies are with the D.A.R. Library, Washington, D.C., and Roger Bartlett, Austin, Tex., and can be viewed at http://www.rabgenealogy.com/ui53.htm. The notes contain some inconsistencies, and page 45 was missing from the D.A.R. Library copy when it was copied. [S1] Ruth Bennett, Naudain Family of Delaware, above, p. 97 (naming Sarah M. Harvey as her mother). [S1] Ruth Bennett, Naudain Family of Delaware (Geneva, Neb. : n.pub., 1941), p. 98. This material is a typescript of "notes" in Ms. Bennett's possession and apparently was originally written and compiled by James W. Lattomus. Copies are with the D.A.R. Library, Washington, D.C., and Roger Bartlett, Austin, Tex., and can be viewed at http://www.rabgenealogy.com/ui53.htm. The notes contain some inconsistencies, and page 45 was missing from the D.A.R. Library copy when it was copied. [S1] Ruth Bennett, Naudain Family of Delaware (Geneva, Neb. : n.pub., 1941), p. 98 (naming George Standish Naudain as his father). This material is a typescript of "notes" in Ms. Bennett's possession and apparently was originally written and compiled by James W. Lattomus. Copies are with the D.A.R. Library, Washington, D.C., and Roger Bartlett, Austin, Tex., and can be viewed at http://www.rabgenealogy.com/ui53.htm. The notes contain some inconsistencies, and page 45 was missing from the D.A.R. Library copy when it was copied. [S312] Social Security Death Index, online at http://tinyurl.com/AncestrySSDI, viewed on 26 Mar 1998. [S312] Social Security Death Index, online at http://tinyurl.com/AncestrySSDI, viewed on 26 Mar 1998 (not naming the place of death but stating that he lived in Bridgeville, Pennsylvania when he died). [S1] Ruth Bennett, Naudain Family of Delaware (Geneva, Neb. : n.pub., 1941), pp. 98-99 (naming Harold Woodward Naudain as her father). This material is a typescript of "notes" in Ms. Bennett's possession and apparently was originally written and compiled by James W. Lattomus. Copies are with the D.A.R. Library, Washington, D.C., and Roger Bartlett, Austin, Tex., and can be viewed at http://www.rabgenealogy.com/ui53.htm. The notes contain some inconsistencies, and page 45 was missing from the D.A.R. Library copy when it was copied. [S312] Social Security Death Index, online at http://tinyurl.com/AncestrySSDI, viewed on 13 Sep 2002 (giving her name as F. A. Naudain). [S312] Social Security Death Index, online at http://tinyurl.com/AncestrySSDI, viewed on 13 Sep 2002 (giving her name as F. A. Naudain; stating that she died on 12 Dec 2000; not naming the place of death but stating that she lived in Norfolk, Va. when she died). Albert Gage ("Big Al") Naudain, from 1976 newspaper. Other Names*: Albert Naudain, A. G. Naudain, Big Al Naudain. [S1] Ruth Bennett, Naudain Family of Delaware (Geneva, Neb. : n.pub., 1941), pp. 98-99 (naming Harold Woodward Naudain as his father). This material is a typescript of "notes" in Ms. Bennett's possession and apparently was originally written and compiled by James W. Lattomus. Copies are with the D.A.R. Library, Washington, D.C., and Roger Bartlett, Austin, Tex., and can be viewed at http://www.rabgenealogy.com/ui53.htm. The notes contain some inconsistencies, and page 45 was missing from the D.A.R. Library copy when it was copied. [S312] Social Security Death Index, online at http://tinyurl.com/AncestrySSDI, viewed on 26 Mar 1998 (not naming the place of death but stating that he lived in Portland, Oregon when he died). [S1449] The Kingston Daily Freeman, Kingston, N.Y., online at http://www.newspapers.com, 15 Feb 1938, p. 3, col. 2. Other Names*: Richard Standish Naudain, Richard Mead Naudain, Richard Naudain. [S1108] Social Security Death Index, online at http://tinyurl.com/RootswebSSDI, viewed on 3 Apr 2010 (Richard Standish Naudain, SSN 568-05-7174). [S1495] The Evening Citizen, Ottawa, Ont., online, above, p. 5, col. 2 (marriage announcement of Doris May Nolan and Richard Standish Naudain) (stating that the ceremony was at 2:30 p.m., conducted by Rev. Father J. Finn). [S1108] Social Security Death Index, online at http://tinyurl.com/RootswebSSDI, viewed on 3 Apr 2010 (Richard Standish Naudain, SSN 568-05-7174) (not naming the place of death but stating that he lived in Oceanside, Calif. when he died). [S1495] The Evening Citizen, Ottawa, Ont., online, above, p. 5, col. 2 (marriage announcement of Doris May Nolan and Richard Standish Naudain) (describing him as a flying officer with the R.C.A.F.). [S1495] The Evening Citizen, Ottawa, Ont., online, above, 8 Jul 1944, p. 5, col. 1 (describing him as a first lieutenant with the U.S. Army Air Corps). Other Names*: Mary Naudain, Mary Rebecca Naudain Calhoun, Mary Naudain Calhoun, Mary Rebecca Calhoun, Mary Calhoun, Mary Rebecca Naudain Calhoun Murphy, Mary Rebecca Calhoun Murphy, Mary Rebecca Calhoun Murphy, Mary Rebecca Naudain Murphy, Mary Rebecca Murphy, Mary Murphy, Rebecca Murphy. • Her BillionGraves record, which includes a picture of her tombstone, is here. [S1] Ruth Bennett, Naudain Family of Delaware (Geneva, Neb. : n.pub., 1941), p. 99 (naming LeRoy Day Naudain as her father). This material is a typescript of "notes" in Ms. Bennett's possession and apparently was originally written and compiled by James W. Lattomus. Copies are with the D.A.R. Library, Washington, D.C., and Roger Bartlett, Austin, Tex., and can be viewed at http://www.rabgenealogy.com/ui53.htm. The notes contain some inconsistencies, and page 45 was missing from the D.A.R. Library copy when it was copied. 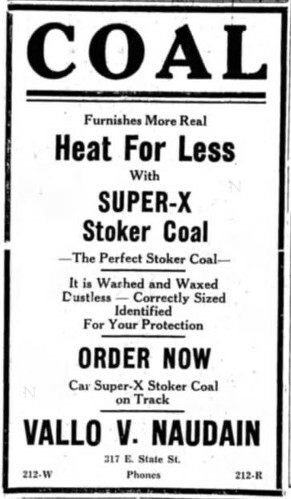 [S1466] Courier-Post, Camden, N.J., online at http://www.newspapers.com, 5 Oct 1936, p. 10, cols. 4-5 ("Miss Naudain . . . Among Early October Brides . . .") (naming LeRoy B. Naudain as her father). [S1] Ruth Bennett, Naudain Family of Delaware, above, p. 99 (giving the date but not the place). [S1258] Billion Graves, online at http://billiongraves.com, record for Rebecca N. Calhoun, viewed on 1 Aug 2018 (giving the year but no other information). [S1483] Massachusetts Death Index 1970-2003, online at https://www.familysearch.org, record for Rebecca N. Murphy, certificate no. 019232, viewed on 5 Aug 2018. [S1466] Courier-Post, Camden, N.J., online, above, 5 Oct 1936, p. 10, cols. 4-5 ("Miss Naudain . . . Among Early October Brides . . .") (stating that the ceremony took place at 2:30 p.m. with the Rev. Oliver C. Apgar, pastor of the church, officiating). [S1480] The Morning News, Wilmington, Del., online at http://www.newspapers.com, 13 Dec 1979, p. 62, col. 4 (obituary for Oakley H. Murphy) (naming her as his surviving wife but not giving any other information). [S1258] Billion Graves, online at http://billiongraves.com, record of Rebecca N. Calhoun, viewed on 1 Aug 2018 (giving the year but no other information). [S1258] Billion Graves, online at http://billiongraves.com, record for Robert S. Calhoun (not giving the date). Parker Naudain, from 1931 newspaper photo of high school basketball team. Other Names*: Parker Naudain, LeRoy Naudain, L. Parker Naudain. Note*: • He graduated from Haddon Heights (N.J.) High School, then attended Friends Central in Philadelphia and Duke University, Durham, N.C., where he was on the track team. • From 1945 to 1982, he was president of Naudain Associates, a manufacturer's representative for electronics equipment. He founded Naudain Academy, a Montessori school in Evesham, N.J; was a member of the board of directors of Home Unity Savings and Loan in Philadalphia; was a member of the Men's Advisory Council of Cooper Medical Center; and was a board member of the Community Blood Bank of Southern New Jersey. [S1] Ruth Bennett, Naudain Family of Delaware (Geneva, Neb. : n.pub., 1941), p. 99 (naming LeRoy Day Naudain as his father). This material is a typescript of "notes" in Ms. Bennett's possession and apparently was originally written and compiled by James W. Lattomus. Copies are with the D.A.R. Library, Washington, D.C., and Roger Bartlett, Austin, Tex., and can be viewed at http://www.rabgenealogy.com/ui53.htm. The notes contain some inconsistencies, and page 45 was missing from the D.A.R. Library copy when it was copied. [S1466] Courier-Post, Camden, N.J., online at http://www.newspapers.com, 16 Mar 1989, p. 7B (p. 19), cols. 1-4 (obituary for L. Parker Naudain). [S1367] The Philadelphia Inquirer, Philadelphia, Pa., online at http://www.newspapers.com, 25 Nov 2003, p. B06, col. 5 (obituary for Ruth A. Naudain) (describing her as "wife of the late L. Parker Naudain"). [S1466] Courier-Post, Camden, N.J., online, above, 26 Nov 2003, p. 20B (p. 32), col. 6 (obituary for Ruth A. Naudain) (describing her as "wife of the late L. Parker Naudain"). [S312] Social Security Death Index, online at http://tinyurl.com/AncestrySSDI, viewed on 27 Mar 1998 (not naming the place of death but stating that he lived in Cherry Hill, New Jersey when he died). [S1466] Courier-Post, Camden, N.J., online, above, 16 Mar 1989, p. 7B (p. 19), cols. 1-4 (obituary for L. Parker Naudain) (stating that he died "after a long illness"). [S1466] Courier-Post, Camden, N.J., online, above, 16 Mar 1989, p. 7B (p. 19), cols. 1-4 (obituary for L. Parker Naudain) (first, second, and third bullets). [S1] Ruth Bennett, Naudain Family of Delaware (Geneva, Neb. : n.pub., 1941), p. 99 (naming Rev. Daniel Ivins Camp as her father). This material is a typescript of "notes" in Ms. Bennett's possession and apparently was originally written and compiled by James W. Lattomus. Copies are with the D.A.R. Library, Washington, D.C., and Roger Bartlett, Austin, Tex., and can be viewed at http://www.rabgenealogy.com/ui53.htm. The notes contain some inconsistencies, and page 45 was missing from the D.A.R. Library copy when it was copied. [S1] Ruth Bennett, Naudain Family of Delaware (Geneva, Neb. : n.pub., 1941), p. 99 (naming John Elias Naudain as his father). This material is a typescript of "notes" in Ms. Bennett's possession and apparently was originally written and compiled by James W. Lattomus. Copies are with the D.A.R. Library, Washington, D.C., and Roger Bartlett, Austin, Tex., and can be viewed at http://www.rabgenealogy.com/ui53.htm. The notes contain some inconsistencies, and page 45 was missing from the D.A.R. Library copy when it was copied. [S312] Social Security Death Index, online at http://tinyurl.com/AncestrySSDI, viewed on 27 Mar 1998 (;stating that he died in Sep 1986; not naming the place of death but stating that he lived in Baltimore, Maryland when he died). [S1365] The Sun, Baltimore, Md., online at http://www.newspapers.com, 19 Sep 1986, p. 74, col. 3 (obituary of Morgan C. Naudain). [S312] Social Security Death Index, online at http://tinyurl.com/AncestrySSDI, viewed on 27 Mar 1998 (stating that he died in Feb 1982; not naming the place of death but stating that he lived in Baltimore, Maryland when he died). [S1412] The Evening Sun, Baltimore, Md., online at http://www.newspapers.com, 25 Feb 1982 (obituary of John C. Naudain). [S1] Ruth Bennett, Naudain Family of Delaware (Geneva, Neb. : n.pub., 1941), p. 100 (naming Archibald Henry Naudain as her father). This material is a typescript of "notes" in Ms. Bennett's possession and apparently was originally written and compiled by James W. Lattomus. Copies are with the D.A.R. Library, Washington, D.C., and Roger Bartlett, Austin, Tex., and can be viewed at http://www.rabgenealogy.com/ui53.htm. The notes contain some inconsistencies, and page 45 was missing from the D.A.R. Library copy when it was copied. [S1] Ruth Bennett, Naudain Family of Delaware (Geneva, Neb. : n.pub., 1941), p. 100 (naming Archibald Henry Naudain as his father). This material is a typescript of "notes" in Ms. Bennett's possession and apparently was originally written and compiled by James W. Lattomus. Copies are with the D.A.R. Library, Washington, D.C., and Roger Bartlett, Austin, Tex., and can be viewed at http://www.rabgenealogy.com/ui53.htm. The notes contain some inconsistencies, and page 45 was missing from the D.A.R. Library copy when it was copied. [S312] Social Security Death Index, online at http://tinyurl.com/AncestrySSDI, viewed on 26 Mar 1998 (not naming the place of death but stating that he lived in Falls Church, Virginia when he died). Note*: • He was a 1930 graduate of Wilmington High School in Wilmington, Delaware. • He had been a technician at Hercules Inc. for thirty-two years. [S1] Ruth Bennett, Naudain Family of Delaware (Geneva, Neb. : n.pub., 1941), p. 100 (naming Arnold Naudain as his father). This material is a typescript of "notes" in Ms. Bennett's possession and apparently was originally written and compiled by James W. Lattomus. Copies are with the D.A.R. Library, Washington, D.C., and Roger Bartlett, Austin, Tex., and can be viewed at http://www.rabgenealogy.com/ui53.htm. The notes contain some inconsistencies, and page 45 was missing from the D.A.R. Library copy when it was copied. [S961] Find A Grave, online at http://www.findagrave.com, memorial for Arnold Naudain, memorial no. 9096370, viewed on 3 Apr 2010 (naming Arnold Naudain as his father). [S312] Social Security Death Index, online at http://tinyurl.com/AncestrySSDI, viewed on 27 Mar 1998 (giving his name as H. Naudain). [S961] Find A Grave, online, above, memorial for viewed on 3 Apr 2010 (Howard Arnold Naudain, memorial no. 9096430). [S312] Social Security Death Index, online at http://tinyurl.com/AncestrySSDI, viewed on 27 Mar 1998 (giving his name as H. Naudain) (giving the date but not the place). [S961] Find A Grave, online, above, memorial for viewed on 3 Apr 2010 (Howard Arnold Naudain, memorial no. 9096430) (giving the date but not the place). [S1379] The News Journal, Wilmington, Del., online at http://www.newspapers.com, 24 Sep 1991, p. B3 (p. 17), col. 4 (obituary for H. Arnold Naudain). [S1343] Journal-Every Evening, Wilmington, Del., online at http://www.newspapers.com, 28 Apr 1942, p. 18, cols. 4-5 (news story about wedding) (first bullet). [S1379] The News Journal, Wilmington, Del., above, 24 Sep 1991, p. B3 (p. 17), col. 4 (obituary for H. Arnold Naudain) (second bullet). [S1379] The News Journal, Wilmington, Del., above, 24 Sep 1991, p. B3 (p. 17), col. 4 (obituary for H. Arnold Naudain) (third bullet). Other Names*: Elizabeth Naudain, Elizabeth Armstrong Naudain Nichols, Elizabeth Naudain Nichols, Elizabeth Armstrong Nichols, Elizabeth Nichols. Note*: • She worked in the advertising department at Continental Diamond Fibre Co. in Newark, Delaware from 1942 to 1960. The then worked for three years in the admissions office at the University of Delaware and several years at the Town Shop in Newark. [S1] Ruth Bennett, Naudain Family of Delaware (Geneva, Neb. : n.pub., 1941), p. 100 (naming Arnold Naudain as her father). This material is a typescript of "notes" in Ms. Bennett's possession and apparently was originally written and compiled by James W. Lattomus. Copies are with the D.A.R. Library, Washington, D.C., and Roger Bartlett, Austin, Tex., and can be viewed at http://www.rabgenealogy.com/ui53.htm. The notes contain some inconsistencies, and page 45 was missing from the D.A.R. Library copy when it was copied. [S961] Find A Grave, online at http://www.findagrave.com, memorial for Elizabeth Armstrong Naudain Nichols, memorial no. 9096459, viewed on 7 Aug 2018 (naming Arnold Naudain as her father). [S961] Find A Grave, online, above, memorial for Elizabeth Armstrong Naudain Nichols, memorial no. 9096459, viewed on 7 Aug 2018. [S175] Supposition as to marriage, based on her using Nichols as her surname by the time of her death. [S1480] The Morning News, Wilmington, Del., online at http://www.newspapers.com, 5 Jul 1988, p. 18, col. 3 (obituary for Elizabeth Naudain Nichols). [S961] Find A Grave, online, above, memorial for Elizabeth Armstrong Naudain Nichols, memorial no. 9096459, viewed on 7 Aug 2018 (giving the date but not the place). [S961] Find A Grave, online, above, memorial for Elizabeth Armstrong Naudain Nichols, memorial no. 9096459, viewed on 7 Aug 2018 (not giving the date). [S1480] The Morning News, Wilmington, Del., above, 5 Jul 1988, p. 18, col. 3 (obituary for Elizabeth Naudain Nichols) (first and second bullets). Marriage*: He married Joanne Alice Lynam. [S1343] Journal-Every Evening, Wilmington, Del., online at http://www.newspapers.com, 19 Nov 1930, p. 4, col. 5. [S1343] Journal-Every Evening, Wilmington, Del., above, 13 Apr 1906, p. 3, col. 2 (naming Howard Jordan as her father). 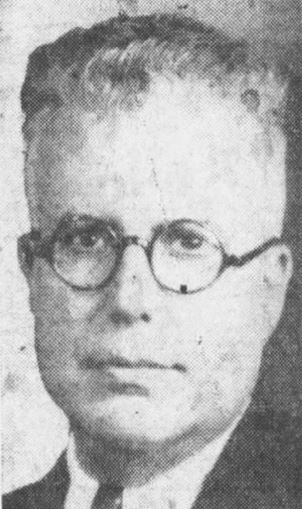 William H. Naudain, from a 1955 newspaper. Note*: • He operated a dairy farm on Little Baltimore Road, Newark, Delaware, for forty-one years; managed the Southern States Cooperative store in Newark for twelve years before 1950; was master of the Harmony Grange and the Pomona Grange in Delaware before taking over direction of the state Grange from 1955 to 1959; was appointed as director of the Delaware Departmenr of Weights and Measures in 1962 and served until 1969; served on the board of trustees of the University of Delaware while state Grange master; was a 32nd degree Mason; was a member of the state draft board during World War II; was a charter member and past president of the Hockessin-Yorklyn Lions Club; and was president of the Farmer's Mutual Fire Insurance Co. of Mill Creek Hundred. [S1] Ruth Bennett, Naudain Family of Delaware (Geneva, Neb. : n.pub., 1941), p. 100 (naming William Peoples Naudain as his father). This material is a typescript of "notes" in Ms. Bennett's possession and apparently was originally written and compiled by James W. Lattomus. Copies are with the D.A.R. Library, Washington, D.C., and Roger Bartlett, Austin, Tex., and can be viewed at http://www.rabgenealogy.com/ui53.htm. The notes contain some inconsistencies, and page 45 was missing from the D.A.R. Library copy when it was copied. [S961] Find A Grave, online at http://www.findagrave.com, memorial for viewed on 3 Apr 2010 (William H. Naudain, memorial no. 9096448) (naming William Peoples Naudain as his father). [S312] Social Security Death Index, online at http://tinyurl.com/AncestrySSDI, viewed on 27 Mar 1998 (William Naudain, SSN 222-07-0718). [S961] Find A Grave, online, above, memorial for William H. Naudain, memorial no. 9096448, viewed on 3 Apr 2010. [S961] Find A Grave, online, above, memorial for William H. Naudain, memorial no. 9096448, viewed on 3 Apr 2010 (not giving the date or place). [S961] Find A Grave, online, above, memorial for Mildred P. Naudain, memorial no. 9096437, viewed on 3 Apr 2010 (not giving the date or place). [S1379] The News Journal, Wilmington, Del., online at http://www.newspapers.com, 17 Jun 1930, p. 10, col. 2. [S312] Social Security Death Index, online at http://tinyurl.com/AncestrySSDI, viewed on 27 Mar 1998 (William Naudain, SSN 222-07-0718) (giving the month and year but not the day; not naming the place of death but stating that he lived in Hockessin, Delaware when he died and that last benefits were sent to an address in Hockessin, Delaware). [S1480] The Morning News, Wilmington, Del., online at http://www.newspapers.com, 23 Jun 1981, p. 20, cols. 5-6 (obituary for William H. Naudain) (stating that he had an apparent heart attack at his home and was dead on arrival at Wilmington Medical Center, Delaware Division, in Wilmington, Delaware). [S1480] The Morning News, Wilmington, Del., above, 23 Jun 1981, p. 20, cols. 5-6 (obituary for William H. Naudain). [S1448] Journal-Every Evening, Wilmington, Del., online at http://www.newspapers.com, 12 Apr 1941, p. 11, col. 8 (naming William H. Naudain as her father). [S1441] Wilmington Morning News, Wilmington, Del., online at http://www.newspapers.com, 11 Apr 1942, p. 20, col. 3 (naming William H. Naudain as her father). Note*: • At the time of his marriage, in 1938, he was associated with the Delaware Rayon Company in New Castle, Delaware. • A brief Wikipedia article about Red Clay Creek Presbyterian Church is here. [S961] Find A Grave, online at http://www.findagrave.com, memorial for viewed on 3 Apr 2010 (Edward A. Naudain, memorial no. 9096373) (naming William Peoples Naudain as his father). [S1] Ruth Bennett, Naudain Family of Delaware, above, p. 100 (giving the date but not the place). [S312] Social Security Death Index, online at http://tinyurl.com/AncestrySSDI, viewed on 26 Mar 1998 (giving the date but not the place). [S961] Find A Grave, online, above, memorial for Edward A. Naudain, memorial no. 9096373, viewed on 3 Apr 2010. [S961] Find A Grave, online, above, memorial for viewed on 3 Apr 2010 (Edward A. Naudain, memorial no. 9096373) (not giving the date or place). [S961] Find A Grave, online, above, memorial for viewed on 3 Apr 2010 (Elizabeth Pyle Naudain, memorial no. 9096383) (not giving the date or place). [S1340] The Morning News, Wilmington, Del., online at http://www.newspapers.com, 11 Oct 1982, p. B6, col. 2 (obituary of Edward A. Naudain) (not giving the date or place). [S1448] Journal-Every Evening, Wilmington, Del., online at http://www.newspapers.com, 23 Jun 1938, p. 14, col. 2. [S1441] Wilmington Morning News, Wilmington, Del., online at http://www.newspapers.com, 27 Jun 1938, p. 12, col. 5 (second bullet). [S312] Social Security Death Index, online at http://tinyurl.com/AncestrySSDI, viewed on 26 Mar 1998 (giving the month and year but not the day; not naming the place of death but stating that he lived in Hockessin, Delaware when he died). [S1340] The Morning News, Wilmington, Del., above, 13 Oct 1982, p. B6, col. 2 (obituary of Edward A. Naudain). [S961] Find A Grave, online, above, memorial for Edward A. Naudain, memorial no. 9096373. viewed on 3 Apr 2010 (not giving the date). [S1340] The Morning News, Wilmington, Del., above, 11 Oct 1982, p. B6, col. 2 (obituary of Edward A. Naudain). [S1448] Journal-Every Evening, Wilmington, Del., above, 23 Jun 1938, p. 14, col. 2 (first bullet). [S1340] The Morning News, Wilmington, Del., above, 11 Oct 1982, p. B6, col. 2 (obituary for Edward A. Naudain) (second bullet). [S961] Find A Grave, online, above, memorial for John W. "Jack" Naudain, memorial no. 70309367, viewed on 11 Aug 2018 (naming Edward Arnold Naudain as his father). [S961] Find A Grave, online at http://www.findagrave.com, memorial for viewed on 3 Apr 2010 (Warner Woodward Naudain, memorial no. 47025831) (naming William Peoples Naudain as his father). [S1087] Obituary of Warner Woodward Naudain, online http://www.obitcentral.com/obitsearch/obits/de/…, viewed on 1 Jul 2006, (not giving the date but stating that he was eighty-three years old when he died on 27 Sep 2000). [S961] Find A Grave, online, above, memorial for viewed on 3 Apr 2010 (Warner Woodward Naudain, memorial no. 47025831). [S1087] Obituary of Warner Woodward Naudain, online, above, (not giving the date or place but stating that they had been married fifty-four years when he died on 27 Sep 2000). [S961] Find A Grave, online, above, memorial for Warner Woodward Naudain, memorial no. 47025831, viewed on 3 Apr 2010 (not giving the date or place). [S961] Find A Grave, online, above, memorial for Carrie Lynam Naudain, memorial no. 47026320, viewed on 3 Apr 2010 (not giving the date or place). [S1441] Wilmington Morning News, Wilmington, Del., online at http://www.newspapers.com, 7 Jan 1946, p. 8, col. 1 (wedding announcement for Carrie E. Lynam and Lt. Warner W. Naudain). [S312] Social Security Death Index, online at http://tinyurl.com/AncestrySSDI, viewed on 13 Sep 2002 (stating that he died on 27 Sep 2000; not naming the place of death but stating that he lived in Hockessin, Del. when he died). [S1087] Obituary of Warner Woodward Naudain, online, above. [S961] Find A Grave, online, above, memorial for Warner Woodward Naudain, memorial no. 47025831, viewed on 3 Apr 2010. Note*: He was from Christiana Hundred in New Castle County, Delaware. Other Names*: Nadaene Casperson Kane, Nadaene Kane. [S1] Ruth Bennett, Naudain Family of Delaware (Geneva, Neb. : n.pub., 1941), p. 100 (naming Robert H. Casperson, M.D. as her father). This material is a typescript of "notes" in Ms. Bennett's possession and apparently was originally written and compiled by James W. Lattomus. Copies are with the D.A.R. Library, Washington, D.C., and Roger Bartlett, Austin, Tex., and can be viewed at http://www.rabgenealogy.com/ui53.htm. The notes contain some inconsistencies, and page 45 was missing from the D.A.R. Library copy when it was copied. [S1460] Naples Daily News, Naples, Fla., above, 19 Apr 1977, p. 27, col. 8 (obituary for Nadaene Casperson Kane) (naming Susan Casperson as her mother). [S1460] Naples Daily News, Naples, Fla., above, 19 Apr 1977, p. 27, col. 8 (obituary for Nadaene Casperson Kane). [S961] Find A Grave, online at http://www.findagrave.com, memorial for Nadaene C. Kane, memorial no. 16543406, viewed on 19 Jul 2018 (giving the year but no other information). [S1460] Naples Daily News, Naples, Fla., above, 19 Apr 1977, p. 27, col. 8 (obituary for Nadaene Casperson Kane) (naming Walter Kane as her surviving husband). [S961] Find A Grave, online, above, memorial for Nadaene C. Kane, memorial no. 16543406, viewed on 19 Jul 2018 (not giving the date). [S1460] Naples Daily News, Naples, Fla., above, 19 Apr 1977, p. 27, col. 8 (obituary for Nadaene Casperson Kane) (indicating that graveside services would be held on 21 Apr 1977). 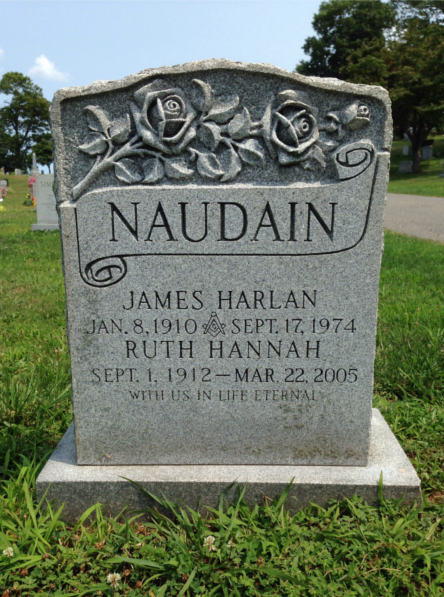 James Harlan Naudain's tombstone, Huntington Rural Cemetery, Huntington, L.I., N.Y., courtesy of Kimberly Glutz. [S1] Ruth Bennett, Naudain Family of Delaware (Geneva, Neb. : n.pub., 1941), pp. 100-101 (naming James Foard Naudain as his father). This material is a typescript of "notes" in Ms. Bennett's possession and apparently was originally written and compiled by James W. Lattomus. Copies are with the D.A.R. Library, Washington, D.C., and Roger Bartlett, Austin, Tex., and can be viewed at http://www.rabgenealogy.com/ui53.htm. The notes contain some inconsistencies, and page 45 was missing from the D.A.R. Library copy when it was copied. [S961] Find A Grave, online at http://www.findagrave.com, memorial for James Harlan Naudain, memorial no. 133513787, viewed on 22 Jul 2018. [S175] Supposition as to marriage, (based on the fact they share a tombstone). [S312] Social Security Death Index, online at http://tinyurl.com/AncestrySSDI, viewed on 27 Mar 1998 (stating that he died in Sep 1974; not naming the place of death but stating that he lived in Huntington, New York when he died). [S1] Ruth Bennett, Naudain Family of Delaware (Geneva, Neb. : n.pub., 1941), p. 101 (naming William Campbell Bennett as his father). This material is a typescript of "notes" in Ms. Bennett's possession and apparently was originally written and compiled by James W. Lattomus. Copies are with the D.A.R. Library, Washington, D.C., and Roger Bartlett, Austin, Tex., and can be viewed at http://www.rabgenealogy.com/ui53.htm. The notes contain some inconsistencies, and page 45 was missing from the D.A.R. Library copy when it was copied. [S1] Ruth Bennett, Naudain Family of Delaware (Geneva, Neb. : n.pub., 1941), p. 101. This material is a typescript of "notes" in Ms. Bennett's possession and apparently was originally written and compiled by James W. Lattomus. Copies are with the D.A.R. Library, Washington, D.C., and Roger Bartlett, Austin, Tex., and can be viewed at http://www.rabgenealogy.com/ui53.htm. The notes contain some inconsistencies, and page 45 was missing from the D.A.R. Library copy when it was copied. [S1] Ruth Bennett, Naudain Family of Delaware (Geneva, Neb. : n.pub., 1941), p. 101 (naming William Campbell Bennett as her father). This material is a typescript of "notes" in Ms. Bennett's possession and apparently was originally written and compiled by James W. Lattomus. Copies are with the D.A.R. Library, Washington, D.C., and Roger Bartlett, Austin, Tex., and can be viewed at http://www.rabgenealogy.com/ui53.htm. The notes contain some inconsistencies, and page 45 was missing from the D.A.R. Library copy when it was copied. [S312] Social Security Death Index, online at http://tinyurl.com/AncestrySSDI, viewed on 24 Mar 1998.